The current entering any junction is equal to the current leaving that junction. 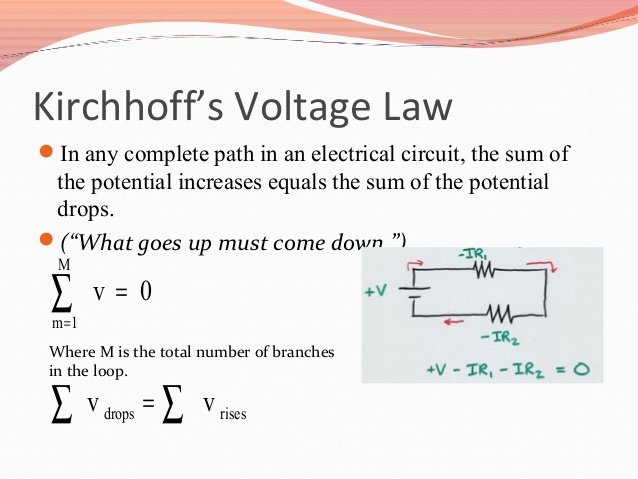 The sum of all the voltages around the loop is equal to zero. Equations 3 and 4 are equivalent as voltage is a signed (positive or negative) quantity depending whether it is emf and potential drop. A voltage divider is a common configuration in analog circuits. It is also known as a potential divider. It is a linear circuit that produces an output voltage (Vout) that is a fraction of its input voltage (Vin). Voltage division refers to the partitioning of a voltage among the components of the divider. The two resistor voltage divider is used often to supply a voltage different from that of an available battery or power supply. In application the output voltage depends upon the resistance of the load (RL) it drives.